Yan, Y., Xu, T., Harikumar, K. G., Miller, L. J., Melcher, K. and Xu, H. E. (2017). Detection of Membrane Protein Interactions by Cell-based Tango Assays. Bio-protocol 7(22): e2903. 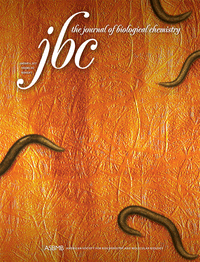 DOI: 10.21769/BioProtoc.2903. The Tango assay is a protein-protein interaction assay, in which a transcription factor (rTA) is fused to a membrane-bound protein via a linker that contains a cleavage site for TEV protease, whereas a soluble interaction partner is fused to TEV protease (Barnea et al., 2008). Association between the two interaction partners leads to an efficient cleavage of the transcription factor, allowing it to translocate to the nucleus and activate a luciferase reporter gene as measurement of the interactions. 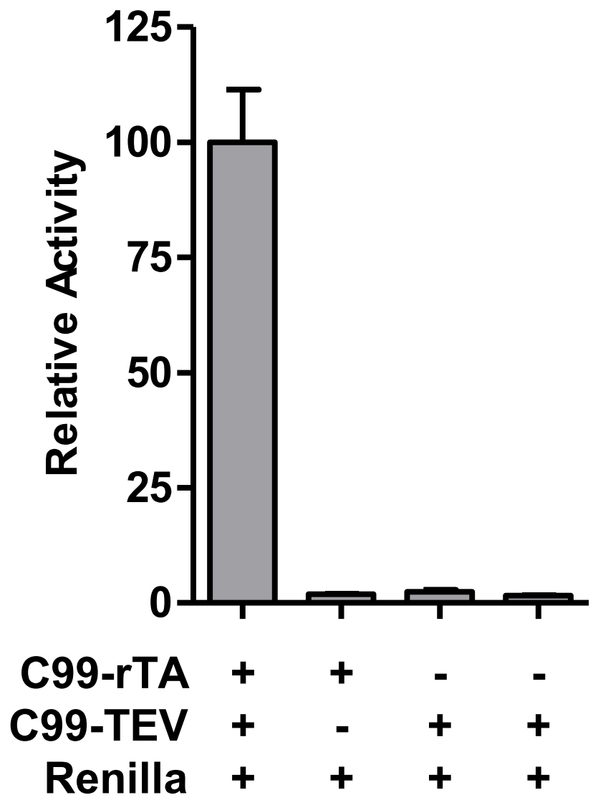 In this modified assay, we fused one copy of the membrane-spanning amyloid precursor protein (APP) C99 region to TEV site-rTA (C99-TEV site-rTA) and a second copy to TEV protease (C99-TEV) to analyze intramembrane C99-C99 interaction in live cells. The amyloid precursor protein (APP) has three dimerization domains in its N-terminal extracellular domain. In addition, APP can also form dimers through the membrane-bound C99 (C-terminal 99 amino acid fragment) region. Importantly, C99 dimerization has been linked to Aβ production in Alzheimer’s disease (AD) pathology. The Tango assay described here and schematically shown as cartoon in Figure 1 is a fast and sensitive method for investigating homodimerization of C99 and other membrane proteins (Yan et al., 2017). Figure 1. Cartoon illustration of the Tango interaction assay. Upon membrane cleavage of the C99 hybrid protein by TEV protease, the rTA transactivator protein is released from the membrane into the cytoplasm. 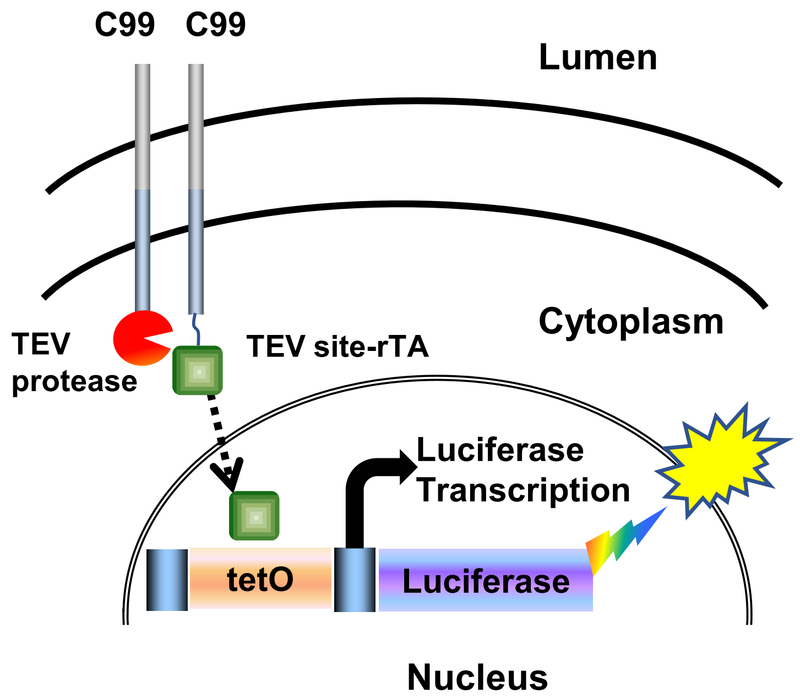 This allows rTA to enter the nucleus and bind the tetO DNA-binding site upstream of an integrated luciferase reporter gene to stimulate luciferase reporter gene activity as measured by luminescence. (Yan et al., 2017). Here we use the Dual-luciferase reporter assay kit. The stably integrated luciferase-Firefly reads represent the γ-secretase cleavage activity, while the transfected Renilla luciferase reads serve as normalization standard. The PS1/PS2-deleted HTL cells are routinely grown in DMEM supplemented with 10% (v/v) FBS at 37 °C under a humidified 5% CO2 atmosphere. Treat the cells with 0.25% trypsin-EDTA at 37 °C for about 2 min. Dilute the cells to 0.4 x 106/ml with DMEM medium (supplemented with 10% [v/v] fetal bovine serum) and split at 50,000 per well into a 24-well plate one day prior to transfection. Make a master mix for larger sample numbers: for example, for 10 samples, multiply by 11 to prepare some extra mix. (10 x 11 = 110 µl medium; 0.195 x 11 = 2.145 µl X-tremeGENE 9 Transfection Reagent). Note: We usually dilute the DNA plasmids to a concentration of 100 ng/µl and store them at 4 °C. Add 10 µl master mix to DNA mix in each well of the 96-well plate and mix gently by pipetting. Carefully transfer 20 µl mix by pipetting into each well of cells cultured in a 24-well plate. Note: In this assay, 10 ng C99 (or its variants)-TEV site-rTA expression construct, 10 ng C99 (or its variants)-TEV protease construct and 5 ng of phRG-tk Renilla normalization luciferase expression vector were transfected together with 40 ng pBSK plasmid control into PS1/PS2-deleted HTL cells. One day post transfection, remove the medium from the cultured cells by vacuum pump attached by tubing to a liquid trap and a gel loading pipette tip, and gently apply a sufficient volume (i.e., 500 µl/well) of PBS (see Recipes) to rinse the bottom of each well. Note: We use Eppendorf® Research® Pro electronic single channel pipette (20-1,000 µl) to dispense the PLB buffer. However, any laboratory pipette that can be set to 100 µl can be used. Transfer 20 µl PLB lysate without cell debris to each well of a 96-well OptiPlate. Program the EnVision Multilabel Plate Reader to perform a 2-sec premeasurement delay, followed by a 10-sec measurement period using the Envision 96 Plate US Luminescence (700 nm emission filter) aperture for each reporter assay. Dispense 50 µl LAR2 substrate (see Recipes) into each well of the 96-well OptiPlate, mix by pipetting 2 or 3 times and measure Firefly luciferase activity using EnVision Multilabel Plate Reader. The Luminescence reads represent the Firefly luciferase activity. Dispense 50 µl Stop & Glo® Reagent (see Recipes) into the same plate, mix by pipetting 2 or 3 times and measure the Renilla luciferase activity by EnVision Multilabel Plate Reader. The Luminescence reads represent the Renilla luciferase activity. Each data point represents the average from at least three independent experiments (Table 1), calculated activities are shown in Table 2. Data are presented as grouped bar graph type. The statistical analysis of data can be accomplished with GraphPad Prism using the two-tailed Student’s t-test versus control (Figure 2). A practical example of the applicability of this Tango interaction assay was recently shown in (Yan et al., 2017). These wells (three wells of Group ctrl1 and three wells of Group ctrl2 should be the negative control, the low Renilla activity, which to some degree reflects the cell status and transfection efficiency, makes the relative activity much higher than normal. Barnea, G., Strapps, W., Herrada, G., Berman, Y., Ong, J., Kloss, B., Axel, R. and Lee, K. J. (2008). The genetic design of signaling cascades to record receptor activation. Proc Natl Acad Sci U S A 105(1): 64-69. Yan, Y., Xu, T. H., Harikumar, K. G., Miller, L. J., Melcher, K. and Xu, H. E. (2017). Dimerization of the transmembrane domain of amyloid precursor protein is determined by residues around the gamma-secretase cleavage sites. J Biol Chem 292(38):15826-15837.